In 1966 Huey Newton and Bobby Seale created the Black Panther Party for Self Defense to address police oppression of blacks in Oakland, California. Because community members also turned to the Panthers for help with economic and social problems like job discrimination and evictions, the Panthers started community services in 1969 to build community self-determination. The Panthers’ first and most successful community program was the Free Breakfast for Children Program. The Panthers started the Free Breakfast Program because hunger and poverty made it difficult for many poor black children to learn in school. In 1968 most poor children went to school hungry and stayed hungry. The national School Lunch Program provided reduced-price, but not free lunches for poor children, and the national School Breakfast Program was limited to a few rural schools. To address this need the Panthers initiated the Free Breakfast Program at St. Augustine’s Church in Oakland in January 1969. Bobby Seale planned the program with Father Earl Neil and Parishioner Ruth Beckford-Smith, who coordinated the program and recruited neighborhood mothers. The Breakfast Program quickly spread to chapters in 23 cites by the end of the year. Local businesses, churches and community-based organizations donated (sometimes with community pressure) space for the program and nutritious food like eggs, grits, toast, and milk. The Panthers fed more than 20,000 children nationally in 1969. By 1971 at least 36 cities had a breakfast program. In a 1969 U.S. Senate hearing, the national School Lunch Program administrator admitted that the Panthers fed more poor school children than did the State of California. The Breakfast Program’s enormous success drew the attention of FBI Director J. Edgar Hoover. He stated that of all the radical black groups, the Panthers were “the greatest threat to the internal security of the country” because of their Free Breakfast Program. Hoover recognized that through the program the Panthers captured the loyalty of many black children by giving them free breakfasts. He was also angry that the breakfast program won liberal whites’ and moderate blacks’ support for the Panthers. Hoover perversely justified FBI attempts to destroy the program because it “is potentially the greatest threat to efforts by authorities to destroy what it [the Black Panther Party] stands for.” The FBI’s attempts to destroy the program included sending forged letters to stores to discourage them from donating food, spreading rumors that the food was poisoned, and even raiding sites while children ate. FBI and local police raids, arrests, and murders of Panther leaders as well as party infighting led to the closure of most Panther chapters and the end of the Free Breakfast Program in the early 1970s. The Seattle, Washington chapter lasted longer than most, hosting the Breakfast Program even after the chapter closed in 1977. The Panthers’ Free Breakfast Program focused national attention on the urgent need to give poor children nutritious meals so they could be successful in school. In 1973 this attention helped lead to Congress’ dramatic increase in funding of the national School Lunch Program so poor children could get free lunches. 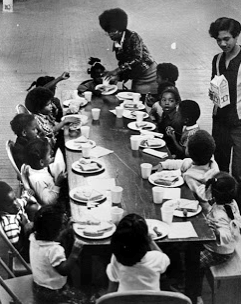 The Panther’s Free Breakfast Program spotlighted the limited scope of the national School Breakfast Program, and helped pressure Congress to authorize expansion of the School Breakfast Program to all public schools in 1975. Joshua Bloom & Waldo Martin, Jr., Black against Empire (Los Angeles: Univ. of California Press, 2013); Nik Heynen, “Bending the Bars of Empire from Every Ghetto for Survival: The Black Panther Party's Radical Antihunger Politics of Social Reproduction and Scale,” Annals of the Association of American Geographers 99: (April 2009); Alison Hope, “Food Policy,” in Michael Wise and Jennifer Wallach eds, The Routledge History of American Foodways (New York: Routledge, 2016); Susan Levine, School Lunch Politics (Princeton: Princeton Univ. Press, 2011); Mapping the Black Panther Party in Key Cities, Mapping American Social Movements Through the 20th Century, http://depts.washington.edu/moves/BPP_map-cities.shtml. Joshua Bloom & Waldo Martin, Jr., Black against Empire (Los Angeles: Univ. of California Press, 2013); Nik Heynen, “Bending the Bars of Empire from Every Ghetto for Survival: The Black Panther Party’s Radical Antihunger Politics of Social Reproduction and Scale,” Annals of the Association of American Geographers 99: (April 2009); Alison Hope, “Food Policy,” in Michael Wise and Jennifer Wallach eds, The Routledge History of American Foodways (New York: Routledge, 2016); Susan Levine, School Lunch Politics (Princeton: Princeton Univ. Press, 2011); Mapping the Black Panther Party in Key Cities, Mapping American Social Movements Through the 20th Century, http://depts.washington.edu/moves/BPP_map-cities.shtml.